In the small town where I used to live there was a café owned and operated by hardworking English couple. They’d established a good clientele, many of them retired, who made a visit to the restaurant part of their daily routine. One of things that brought customers back to the café day after day was the baking. The owners would come in during the wee hours of the morning and produce—from the restaurant’s single, elderly, four-burner-one-oven, home-style, electric stove—a wonderful array of scones, pies, and pastries both savoury and sweet. As might perhaps be expected, years of working from before dawn until after dinner service eventually took their toll. The English couple sold their restaurant to the local baker. He viewed the café as another venue through which he could market the products from his bakery and was confident that they were fine enough to please the café’s long time customers. I was working at the bakery at the time the café changed hands, and moved from working in the bakery to working in the restaurant. The baker had not required that the café’s original owners leave any of their recipes but he had hired one of their long time employees to continue on as cook. She was instructed to teach me the restaurant’s recipes and routines, and this she did very well. She did not, however, like sharing her kitchen or working for her new employers, and quit just a few months after they took over the restaurant. I stepped into the kitchen in her stead. I enjoyed my new job but noticed that many of the café’s long time customers remarked upon the scones. It was not that there was anything wrong with the scones provided by the bakery—they were fine—but the customers missed the ginger scones baked by the original owners. The baker did try to make a ginger scone but he flavoured it only with dry ginger and it didn’t measure up to the wonderful, strong ginger flavour the customers had come to expect. I decided to experiment with a ginger scone of my own. I used crystallized ginger in my scones, together with dry spice, and baked them in wedges with crunchy sugary tops. They were an instant hit. I’m still a big fan of crystallized ginger. I enjoy its particular balance of spicy and sweet, but it’s a treat around here; I don’t always keep it in the pantry. This week I was fortunate enough to have a quantity of crystallized ginger on hand, left over from canning pears so I decided to make some ginger scones for our Meatless Monday dessert. 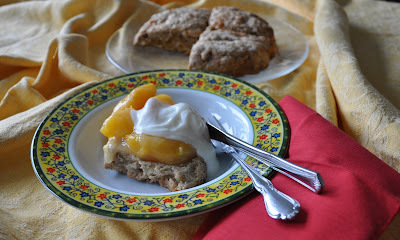 I split the scones and dressed them with hot peaches and cold vanilla yogurt. They were lovely. Begin by dicing the ginger. Set it aside. Preheat the oven to 400 degrees Fahrenheit. In a large bowl, stir together the flour, baking powder, sugar, cinnamon, ground ginger and salt. When they’re combined, cut in the butter just as you would for making pastry. I actually break the butter up with my fingers, squishing it into flat flakes of butter rather than cutting it into chunks. The pieces of butter should be quite coarse. When I break the butter up with my fingers they end up being about the size and shape of corn flakes. If you’re using a knife or pastry cutter, they should be no smaller than a large pea. Once the butter is incorporated, add the diced crystallized ginger, tossing lightly to distribute it through the dry ingredients. Beat the eggs and cream together and then add them to the dry ingredients to make a stiff dough. Turn the dough out onto a lightly floured board and knead it just until it sticks together. Form the dough into a ball and roll it out into a circle about an inch thick. Score the dough into wedges. I make four wedges when using it for dessert (each wedge makes two servings) but it’s more usual to make six or even eight scones from this amount of dough. Line a baking sheet with parchment and then place the scored dough round onto the paper. Brush the top of the dough with the reserved egg white and sprinkle it with sugar. Be generous; the sugar and egg white will form a lovely, crispy top crust. Bake the scones for about 15 minutes, until they are golden brown. While the scones are baking, drain the syrup from your canned peaches into a small saucepan and mix in the cornstarch until it’s dissolved. Heat the mixture over medium-low heat until it comes to a boil and thickens. Add the reserved peaches and stir them gently into the thickened syrup. Keep them warm on low heat until the scones are done. When the scones are baked, take them from the oven and cut the round into wedges. Split the scones in half. If you’ve baked large scones like I do, allow one scone for every two servings. Place the scone halves on dessert plates and spoon the peaches over them. Top the peaches with vanilla yogurt and serve your dessert while it’s still piping hot.